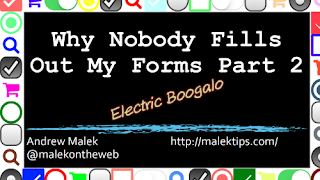 Thanks for coming to my speech, "Why Nobody Fills Out My Forms Part 2: Electric Boogalo"! 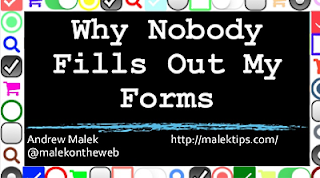 Still having difficulty encouraging people to fill out web forms to sign up for newsletters, apply for jobs, or complete their online shopping orders? Find out even more tips to help keep people from abandoning early, such as making form field widths more convenient, easing credit card entry, grouping related fields into sections to promote scanning, and styling buttons and controls so your webpage does not look like it was written in 2000. 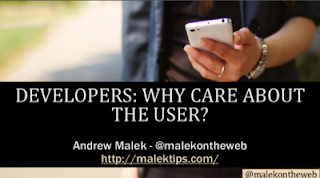 Thanks for coming to my speech, Developers: Why Care About the User! Thanks for coming to my speech, Tablets and Hybrids Need Mobile-Optimized Websites, Too! 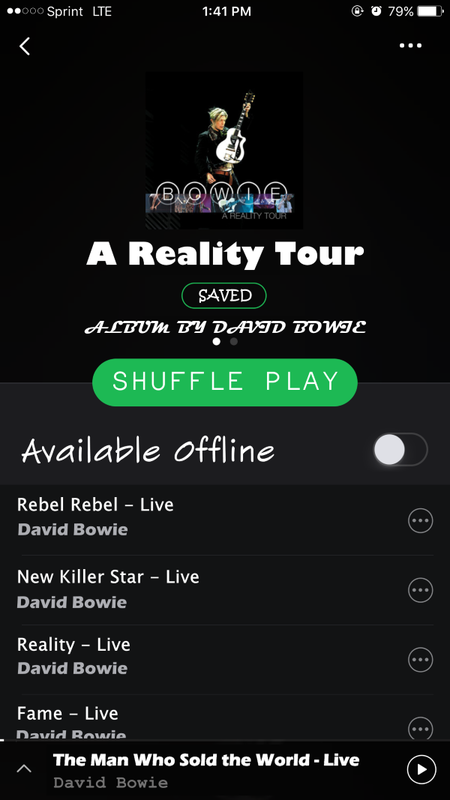 Slides to my Connect.TECH 2016 and Scenic City Summit talk - Tablets and Hybrids Need Mobile-Optimized Websites, Too! - are now available at SlideShare! It takes extra work to deliver a truly responsive website. Since larger tablets and hybrids such as iPad Pros and Windows Surface devices can fit the full size of a standard laptop/desktop website, a tempting thought is to save time and deliver to them the exact same experience. This talk may change your mind, elaborating on why that kind of thinking can hamper the user experience and possibly drive people away, perhaps to access your website on a laptop or smartphone, or worse yet to a competitor. What Content Must Your Restaurant Website Display? "Amanda steps out with her officemates for lunch, and no one has a strong opinion where to eat. She picks up her phone and searches for Mediterranean restaurants, and lucky you! Yours appears near the top of the list. 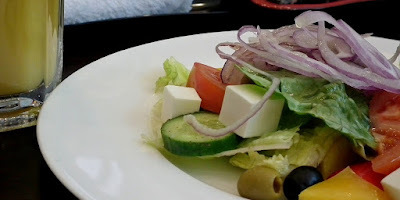 While the well-placed photos of dolmas and falafel look enticing, what isn’t alluring is the long wait as she downloads a full menu. After waiting ten seconds for the list of appetizers to appear, it’s on to the next restaurant from the list." If you own a restaurant and this happens to you, congratulations! You just lost several customers, perhaps permanently. With so many restaurant choices available in many areas, and with information available at the press of a screen or button, your website needs to offer what people want – and quickly. 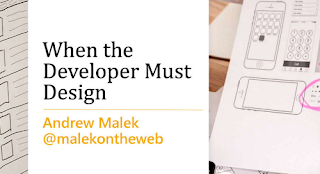 Slides to my CodeStock and DevNexus 2016 talk - When the Developer Must Design - are now up at Speaker Deck! Websites referenced in my CodeStock and DevNexus 2016 talk - When the Developer Must Design - are listed below.